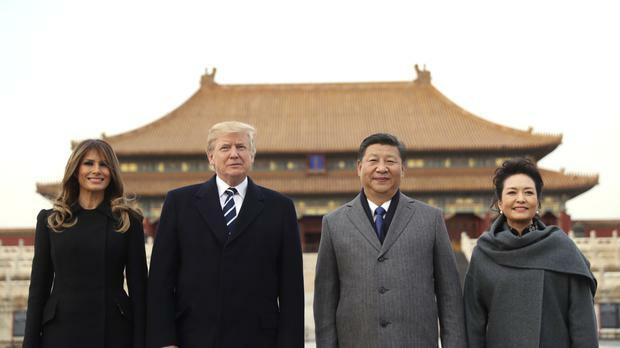 US President Donald Trump nodded appreciatively as China's leader Xi Jinping showcased a centuries-old temple during a visit to Beijing's Forbidden City. He clapped along as the two leaders watched a Chinese children's opera, and the men shared a traditional tea and salutations of friendship. Mr Trump's two-day visit to China opened with diplomatic niceties aplenty on Wednesday. But thorny issues await the two world leaders behind closed doors, including potential tensions over trade and China's willingness to put the squeeze on North Korea over its nuclear weapons programme. Ahead of his arrival, Mr Trump delivered a stern message to Beijing, using an address to the National Assembly in South Korea to call on nations to confront the North. "All responsible nations must join forces to isolate the brutal regime of North Korea," Mr Trump said. "You cannot support, you cannot supply, you cannot accept." He called on "every nation, including China and Russia", to fully implement UN Security Council resolutions against North Korea enforcing sanctions aimed at depriving its government of revenue for its nuclear and ballistic missile programmes. The latest measure, adopted after a September atomic test explosion, the North's largest yet, banned imports of its textiles and prohibited new work permits for overseas North Korean workers. It also restricted exports of some petroleum products. White House officials said Mr Trump would make the same pitch to Mr Xi in private when the two sit down together on Thursday. China is North Korea's largest trading partner and Mr Trump is expected to demand that the nation curtail its dealings with Pyongyang and expel North Korean workers from its borders. Mr Trump has praised China for taking some steps against Pyongyang, but he wants them to do more. China is increasingly disenchanted with North Korea over its nuclear weapons development but remains wary of using its full economic leverage over its traditional ally. It fears triggering a collapse of the North's totalitarian regime that could cause an influx of refugees into north-eastern China and culminate in a US-allied unified Korea on its border. China poured on the pomp and pageantry for Mr Trump's arrival. The president and first lady Melania Trump were greeted at the airport by dozens of children who waved US and Chinese flags and jumped up and down. The couple spent the first hours of their visit on a private tour of the Forbidden City, Beijing's ancient imperial palace. It is usually teeming with tourists but was closed to the public for the presidential visit. The Trumps walked alongside Mr Xi and his wife through the historic site and admired artefacts from past centuries. Mr Trump posed for photos and, with a wave of his hand, joked to Mr Xi about the reporters watching. He laughed and clapped along during an outdoor opera featuring colourful costumes, martial arts and atonal music. Mr Trump said afterwards that he was "having a great time" in China. But much of the remainder of his stay in Beijing will revolve around deep negotiations over trade with Pyongyang and other matters. The president also is expected to showcase a round of business deals signed Wednesday by Chinese and US companies. Such contract signings are a fixture of visits by foreign leaders to China and are aimed at blunting criticism of Beijing's trade practices. It's "a way of distracting from the fact that there's been no progress in China on structural reform, market access or the big issues that the president has tried to make progress on with regard to China", said Elizabeth Economy, the director for Asia Studies at the Council on Foreign Relations.